Chondrocalcinosis, more formally known as calcium pyrophosphate dihydrate deposition disease (CPPD), is a condition in which calcium forms crystals that build up in the cartilage of joints. It's one of those things that most typically occurs as people get older. According to the Arthritis Foundation, half of folks over 85 have calcium crystals in the soft tissue of their joints. Besides age, other risk factors for CPPD include genetics (the disease tends to run in families); a condition in which the body stores more iron than it needs, called hemochromatosis; low levels of magnesium; and certain thyroid problems. As you can imagine, cartilage is no match for the sharp little crystals. They can irritate the more forgiving tissue and cause inflammation that in turn leads to a breakdown of cartilage. 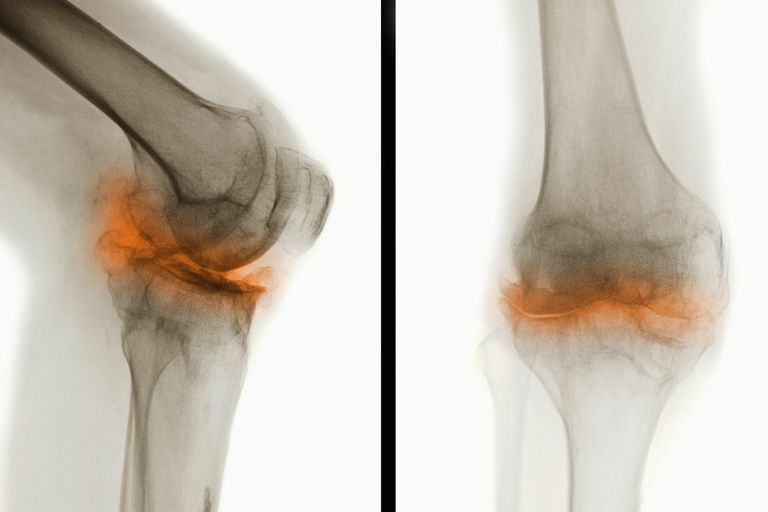 Osteoarthritis that's characterized by degeneration of specific joints in a specific order: first knees, then wrists, followed by the joints where fingers attach to the hand (metacarpophalangeal joints), hips, shoulders, elbows, and finally ankles. The breakdown of joints may be more advanced on one side of the body, and with time they may become deformed. These symptoms affect about half of people with CPPD. Painful attacks of inflammation in which a joint, usually the knee, becomes hot, red, swollen, and stiff. A fever may develop. Because these symptoms are similar to those of an autoimmune disease known as gout, when CPPD takes on this form it's often called pseudogout. These episodes can last for days or weeks, according to the Mayo Clinic. If someone has them for years, their joints can wind up permanently damaged. About a quarter of people with CPPD will develop pseudogout. Chronic symptoms that resemble those of rheumatoid arthritis (RA), including stiffness in joints in the morning, fatigue, and low-grade inflammation. The symptoms of this RA-like condition tend to involve several joints in a symmetric pattern (affecting the same joint on each side of the body, such as both wrists or both knees). It affects about five percent of those with CPPD. Whatever form it takes, the goals of treating CPPD are to reduce inflammation, relieve pain, and bring more range of motion to joints. For inflammation, swelling, and pain, nonsteroidal anti-inflammatory drugs (NSAIDs) are usually effective. Some people will get relief with over-the-counter NSAIDs such as Advil and Motrin (ibuprofen) and Aleve (naproxen). If these don't work, a doctor can prescribe a stronger NSAID like naproxen. Pseudogout is often relieved with low doses of a prescription drug called colchicine that's used to treat gout. Sometimes it's taken every day to ward off episodes of pseudogout. A corticosteroid such as prednisone is another option for relieving pain and reducing inflammation. All of these drugs have potential side effects that could be problematic for older people, so it's important to work closely with a doctor to put together a drug regimen that will do more good than harm. When a joint affected by CPPD becomes extremely painful and swollen, your doctor may drain some of the fluid that's built up by inserting a needle into the area. This also will remove some of the crystals from the joint. After that, a numbing medication and a corticosteroid can be injected into the joint. Arthritis Foundation. "Calcium Pyrophosphate Deposition Disease (CPPD)." MacMullan, Paul and McCarthy, Geraldine. "Treatment and Management of Pseudogout: Insights For the Clinician." Ther Adv Musculosketlet Dis. 2012 Apr; 4(2): 121–131. Mayo Clinic. "Pseudogout." Jul 2, 2015.